Got this from Supermodel's Secret. Boasting to have 1000mg of collagen, I'm sure it attracted many people. 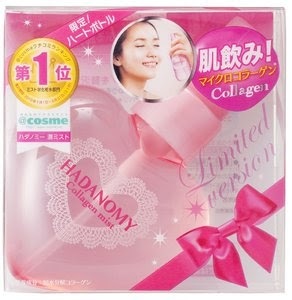 I don't believe spraying collagen on your skin actually helps but I just got it because many girls said it's hydrating. Can be used as a toner or before/after makeup. The roundish pink bottle with laced heart is just too darn cute! There's even a mini version that comes in a heart shaped bottle! Comes with a spray cap. Even though it's called a collagen MIST, I wouldn't say it's actually 100% mist as there are some bigger blobs of liquid. Some people spray this on a cotton pad to use as a lotion/toner. Yes, this is how I look like when I spray it on my face lolol Close my eyes tight and hide my lips. I should really just stop taking photos in tube tops.. When I spritz this on my face, it's so refreshing and I love the smell! It's a very light and pleasant scent that reminds me of fresh juicy pomelos! My conclusion : Overall, I wouldn't say it helped with hydration. Probably just a light spritz before applying makeup? It absorbs fast and doesn't leave residue behind. You can bring this out and spray it on whenever your face feels hot and dry. HAHA! Yes.. I'll remind myself on that.. Well, this one didn't smudge my makeup. I just spray and pat it in.